I feel like I'm writing an advertisement for Dockers, but trust me, I'm not. This ad campaign caught my eye for a few reasons and I feel compelled to talk about it. 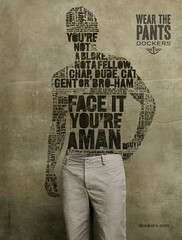 First, whenever I hear about Dockers, I think of a movie quote where someone says that no one gets laid wearing Dockers. I'm sure that's not true. Undoubtedly, there is the lucky odd duck out there wearing Dockers who happens to stumble into an unsuspecting female with low self-esteem. Score! Second, the news item I read which alerted me to this ad campaign tried to link it to research on the decreasing testosterone levels in men worldwide. Will Dockers be soaking their pants in testosterone? Will I have to fight off the ladies and the bears when I stroll around SF wearing them? One should be so lucky. By the way, does the aging population have anything to do with the decrease? Just a guess. Third, even without a torso and head this model looks hot. And that's what I like in advertisements: attractive models. Now, what are they selling again? Huh. That's rather good graphic design. I would never believe that a word cloud could look "attractive."